The item itself was dispatched and delivered on time and was in perfect condition on arrival, sealed and with no cracks or scratches in the discs. The series though, isn't as good as many make out though, there was hardly any of the story from the manga in it and there were several characters that were anime-exclusive that didn't entirely make sense. This may put off new watchers, but beside the fact that there was little to no real story to it, it is a decent series that is guaranteed to make people laugh at points. I do not recommend watching it in English, unless you want to deal with horrible English accents, aside from a select few, J. Michael Tatum (Sebastian), R. Bruce Elliott (Tanaka) and Daniel Fredrick (Grell) being amongst those very few. You'll find that many of the actors mispronounce Tanaka's name throughout both seasons, which they do through many other series of anime and is something they are very well known for doing. If you can deal with this, then go ahead, but it is not something I'd subject myself to. Aside from all this, it is a decent series to watch if you are just starting to watch anime and are looking for a new series to watch. Previously watched the show on Netflix and loved it so I had to go and buy it! I had read a few volumes of the manga before starting the show so it was interesting to see how it was all shown on the screen! 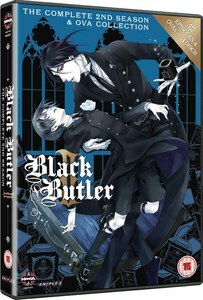 I bought Black Butler - The Complete Series as a present for my anime loving daughter. You do seem to get an awful lot for your money and it's all beautifully packaged.